Here are a few photos of our hunt with NTSHONALANGA SAFARIS, in March of this year. Eight of us went on this hunting trip. We have nothing but very high praise for everyone involved in our hunt, especially Peter and Deon, who did everything possible to make our hunt a memorable experience. It is was the first time we hunt with them, and we certainly look forward to hunting with them again. We hunted in 3 separate areas, one in the north of the country, near the town of Ellisras. MW, the owner of this ranch, and his family, treated us like part of their own family. Everyone of us enjoyed their hospitality. I had 2 rifles with me on this hunt. My old faithful, the 375/404 which I had built on a Dakota 76 action. This one has been on 8 safaris so far, and has become my favourite dangerous game rifle - in fact, I seem to be using it for most of my hunts. The Barnes 300 grain X bullet was used in this rifle, driven to just over 2800 fps. The second was a wildcat I had built on a Remington 700 action. It is chambered for the 7mm Dakota necked down to 270. It turned out to be great for some of the longer shots we had to take on this hunt. I used the Jensen 150 grain bullet in this rifle, at around 3200 fps. We were driving along in the morning, when we came across two kudu bulls drinking from a small lake. They took off as soon as they saw us. Deon and I jumped from the truck and tried to see if we could get a shot at one of them. They were walking through the brush going away to our left. Deon was looking through his binoculars, and telling me which one to shoot. That was not so easy, as there was quite a bit of brush between us and them. Eventually, this bull had to pass through a small clearing, lowering his head in the process. My shot broke his neck, and he dropped in his tracks. A great way to start a hunting day. I used the 375/404, and the distance was around 100 yards. Peter Harris, Anna Marie, Deon and myself. We found this zebra late in the morning. He was feeding as we were passing along. He ran off for a few yards, dropped down, got up again, ran off a few more yards, then dropped dead. This happened as soon as he got a Barnes X 300 grain bullet into his heart. He was about 100 yards away. Deon, Peter Horst and myself. Another animal shot early in the day. We found a few impala feeding, and Deon decided I should shoot this one. That is our camera man Alan Vincent. 375/404, about 60 yards. Our camera man turned hunter, Alan. We were walking in the bush looking for blue wildebeest when we saw this bull all on his own. Alan and myself quickly swapped equipment - I gave him my rifle, and he gave me his video camera. He did a great job of shooting this gemsbok, while at the same time I was struggling to use that video camera. He was kind enough to give me a quick lesson after this episode, and I did manage to film him on his next hunts. Alan, Peter, myself and Deon. 375/404 around 100 yards. We always had great food and drink waiting for us at MW's camp, and this is one of my favourites. The pitch fork on the left is what they use in Africa as a steak fork. This is the courtyard at MW's camp. It is surrounded by marula trees, which had lots of fruits. They kept falling on our heads, but were great to eat. No wonder elephants love them. You can see the swimming pool in the background, and the BBQ area is next to it. Horst on his computer as usual, Dwight, Todd and Alan were enjoying a cool drink, and Anna Marie, Horst's wife, is trying to get out of the picture, as she said she wasn't really looking forward to be seen with such company! I did not do well on this blue wildebeest. My shot went to far back, and we had to chase him and shoot him again. He therefore got named "our practice gnu". 375/404 about 200 yards. Another animals shot early in the morning. It was raining, and we were driving along when we saw this red hartebeest. I shot at him from around 250 yards while he was walking away and missed. We got closer, and saw him walking in the bush. This time he was much closer - about 60 yards away. He dropped at the shot, and everyone thought he must have died of shock, as he did not have any bullet hole in him! Horst, Deon and myself. 374/404, 60 yards. I shot this blue wildebeest at a place close to Pretoria. He bellowed just like a buffalo after he got shot. Peter, Deon, Leon, myself and Horst. 375/303 about 120 yards. This is a cow gemsbok - they generally have longer horns than the bulls. Again, this was in the ranch close to Pretoria, the same morning as we shot the blue wildebeest above. Horst and myself. 375/404 about 80 yards. We moved down south close to the border with Lesotho, to a ranch called Bokport. The gentleman drinking a cup of coffee on the left is Christo, our host at Bokport, Hanis, his horse wrangler, Willem and David, both very good professional hunters, Mike, Hanna, Horst and Anna Marie. We have just come back from a hunt, and are waiting for our lunch. Christo and his people at the camp did just as well as MW's people at keeping us all very happy. We enjoyed hunting this area very much. There is a story to tell about this "unicorn", but I better keep it off a public site! Alan shot it on a bet from Peter. He missed it first, then hit it smack in the head. It seems this poor blesbok's head keeps getting in the way of things! Peter, Alan and Deon. 270/7mm Dakota. Alan and me had a double on springboks here. I shot mine first, they ran a few yards and stopped, and then Alan got his. They wwere about 200 yards away. We both used my 270/7mm Dakota. I shot this mountain reedbuck at the same place Alan and me shot those springboks above. 270/7mm Dakota at about 200 yards. A couple of views of the mountains we hunted in. 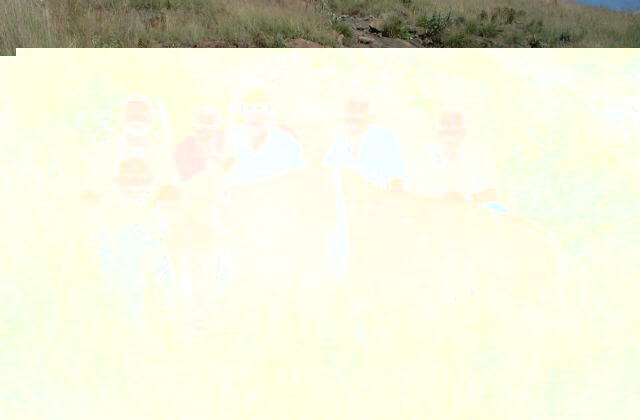 The photo on the right is Lesotho, as it was from the border with South Africa. This is Christo trying to do his Ali Baba magic trick! He is actually cooking some eggs on very hot rocks. He just put some butter on the rock, and what you see is the smoke coming out. We all cooked our dinner one evening this way. I never realized that my steak would ever cook on those rocks, but it certainly did, and we had a great steak dinner. They put those rocks in the oven for 4 hours, by which time they are hot enough to cok on. Alan shot this black wildebeest. Finally, I did manage to take a video of his hunt. He used my 270/7mm Dakota, distance was about 250 yards. Here are the girls trying to show us all off. 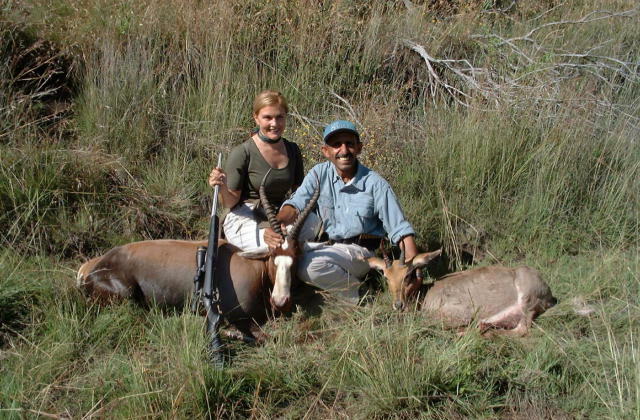 Hanna and Anna Marie caught this blesbok using a machete and a pocket knife! It did not matter to either of them that it was already dead from a bullet. 18" machete and a 4" Columbia River knife, distance, 0 yards! I shot this eland high up in the mountains, after a trying trip on horse back. We found 8 bulls, and managed to get to about 500 yards from them. This is the longest I have ever shot at big game. Horst, Christo and his daughter, Peter, Deon and me. 270/7mm Dakota. This is Christo's Baths, high up in the mountains. Our two PH must have had a very tiring morning, as they are the only ones lying down. A very successful morning. We got a very good blesbok and a very good mountain reedbuck. I shot the blesbok, and while were waiting for him to brought down, we saw this mountain reedbuck below us. He was in the middle of some bush, and we had quite a time trying to figure if it was a male of not. Eventually Peter determined that it was, and I shot him. 270/7mm Dakota, both about 200 yards.